A sketch of Hannah Penn. Hannah Callowhill Penn was the second wife of William Penn, who founded Pennsylvania. After William Penn had a stroke in1 712, Hannah took over his business affairs. After his death she was the Proprietor (head of government) of Pennsylvania. Hannah Callowhill was born on February 11, 1671. She was born in Bristol, a city in England. Her parents had nine children. All of the other children died. Hannah grew up an only child. Hannah’s father ran a business. He made buttons. Hannah’s mother helped poor people. They were Quakers. Hannah was a clever child. Her father taught Hannah about money. He taught her to keep accounts. He taught her about running a business. Her mother taught her how to cook. She learned how to take care of a home. Hannah grew up dignified and charming. She had large brown eyes. She was shy. Many girls her age were married. Hannah was not. When Hannah was 24, she met William Penn. William Penn was a businessman. He was a widower. He had three grown-up children. William was 52 years old. He liked Hannah very much. William Penn was the son of an Admiral. His father had done good work for King Charles II. The King had not paid him. He paid William instead. He paid him in land. The land was in America. William called it Pennsylvania. William was a Quaker. He wanted people to be free to worship. He invited people to come and live in his colony. He would sell them land. They could live in peace. William had gone to Pennsylvania. He had a fine house there. He had come back to England. This is when he met Hannah. William courted Hannah. He wrote her letters. He asked her to marry him. Hannah and William were married on March 5, 1696. They went to live in William’s house in England. It was in the country. William’s son was there. His name was Springett. He was very sick. Hannah nursed him. He died on April 10, 1696. William was the Proprietor of Pennsylvania. That meant he was in charge. He was the head of the government. It was hard to manage a colony from far away. William decided to leave England. He would go to Pennsylvania. He and Hannah packed their bags. On September 3, 1699 the Penns got on a ship. It was called the Canterbury. The ship sailed for America. Two people went with them. One was James Logan. He was William’s new secretary. The other was William’s daughter. Her name was Letitia. The trip was hard on Hannah. The food was salty. The sea was rough. Hannah was pregnant. She was seasick. The ship arrived in Philadelphia in December. Hannah was happy to go ashore. Some people met them at the dock. One family was the Carpenters. Mr. Carpenter was a merchant. Mrs. Carpenter took Hannah to her home. It was called the Slate Roof House. She put Hannah to bed and took care of her. The Penns lived with the Carpenters. In January Hannah had a baby boy. His name was John. William’s house in America was called Pennsbury Manor. It was not in Philadelphia. It was 24 miles up the river. In spring the family moved there. They went by barge. The house was very big. Hannah had a few servants. They worked together. There was a lot to do. There was a garden to tend. They spun yarn. From the yarn they wove cloth. Hannah made medicine. She used herbs from the garden. Hannah made beer, ale, and marigold wine. She planned meals. There were no stores and no neighbors. James Logan was in Philadelphia. Hannah wrote letters to him. She asked him to send her candles and a washtub. She asked for many other things too. Hannah’s father had bought some land in Pennsylvania. Hannah managed the land for him. She wrote many letters to friends in England. When winter came the family moved to Philadelphia. Hannah enjoyed living in town. William heard some bad news. He heard that the Crown might take over Pennsylvania. This would leave William with nothing. He needed to go back to England. He had to fight to keep his colony. William told Hannah to stay in Pennsylvania. Hannah would not. She said she would go with him. The Penns sailed back to England. They arrived in December 1701. Hannah was expecting another baby. She went to live with her parents. William went to London. Baby Thomas was born on March 9, 1702. William had had enough. He did not want to manage a colony any more. He decided to sell the rights to Pennsylvania to Queen Anne. He asked for twenty thousand English pounds. Queen Anne thought that was too much. After a while he lowered the price. He asked for twelve thousand pounds. He waited for an answer. Years ago William had a secretary. His name was Philip Ford. He had fooled William. He gave William some papers to sign. William signed them. He did not read them. The papers gave Pennsylvania to Philip Ford. Now Philip Ford was dead. His widow came to William. She asked for payment for Pennsylvania. They went to court. There was a long battle. It lasted until 1708. Then Mrs. Ford agreed to take 7600 English pounds. William did not have that much money. Some merchants helped him. They raised the money. They paid Mrs. Ford. Now William did not owe her anything. The merchants gave William a mortgage on Pennsylvania. He could pay them back slowly. William had two grown children. William Jr. spent a lot of money. He asked his father to pay his debts. Letitia got married. Her husband asked for money too. Hannah tried to save money. She went to live with her parents. She had three more children. Their names were Hannah Margarita, Margaret, and Richard. Then Hannah moved to London. She went to live with William. She had two more children. Their names were Dennis and Hannah. Both little girls named Hannah died. In 1708 the Penns rented a house. It was in the village of Ruscombe. Hannah thought it was too big. William liked it. They tried to live simply. They needed to pay off their debt. William Jr. sent his family to live with them. He went off to have fun. Hannah was responsible for this family as well as her own. There was never much money. Hannah sold some land that she had. James Logan sent some money and goods from America. Slowly they began to pay what they owed. Hannah’s parents died in 1912. Hannah had the job of settling her father’s business matters. She took care of all his affairs. In October of 1712 William was writing a letter. Suddenly he stopped. He had had a stroke. It affected his mind. He became like a child. He was easily upset. The doctors told Hannah to keep him calm. Now all of the family’s cares were on Hannah’s shoulders. Hannah was already caring for her large family. Now she had a colony to worry about as well. William had tried to treat the people of Pennsylvania fairly. Hannah wanted the same thing. She became the Acting Proprietor of Pennsylvania. James Logan and Isaac Norris were both in Pennsylvania. They were honest and loyal. Hannah asked for their help. They agreed. Hannah wrote them many letters. She told them what to do. They followed her wishes. Hannah could not write letters during the day. Seeing her writing upset William. She had to do everything after he was asleep. He was sweet-tempered and cheerful. He did not remember very much. When Hannah needed him to sign some papers, she had to guide his hand. There were many problems in Pennsylvania. The current governor was not very good. He did not like taking orders from a woman. There were arguments over the border between Pennsylvania and Maryland. People did not pay their rents. Hannah and her helpers did their best. Tom became sick. He had smallpox. After he recovered, John got smallpox. Hannah nursed her sons and her husband. William’s last years were simple. He did not understand much. He did not always know where he was. He loved to be with children. On July 30, 1718 William began to shiver. He had a fever. He died that day. William had written a will before he became ill. He left the government in trust to two friends. Their job was to sell enough of Pennsylvania to pay William’s debts. He left some land to Letitia and his grandchildren. William Jr. was given some land in Ireland. The rest of Pennsylvania went to Hannah and her children. William Jr. did not like this. He wanted more. He contested the will. That means he went to court to get it changed. He tried to get Hannah’s income stopped. She had not even paid for William’s funeral when this happened. At first the court favored William Jr. Usually an estate went to the oldest son. But many people spoke up for Hannah. The court decided for Hannah instead. Hannah did not need a big house any more. She had kept it for William. Now she could move to a smaller place. She moved to some rented rooms in 1719. She had paid half of the debt by now. Hannah decided to sell the furniture from Pennsbury Manor. This would bring in some money. William Jr. died in 1720. Hannah hoped that this would bring peace. It did not. William’s son Springett had grown up in Hannah’s house. He loved Hannah. But he also loved money. Now he tried to get his grandfather’s will changed. Hannah was now Proprietor of Pennsylvania. She was the legal governor. Hannah kept trying to sell the government of Pennsylvania. She sent two petitions to the government. She continued to be firm about Pennsylvania’s border with Maryland. James Logan was a great help. He was a good friend to Hannah. He named one of his daughters after her. Hannah had a stroke in 1721. Her mind was still sharp. Her body was weak. In 1722 her son Dennis died of smallpox. He was 16. Hannah was very sad. She did not write letters for 20 months. James Logan was worried. He thought that she was upset with him. She asked John to write to Logan for her. John explained that she was ill.
James Logan was worried about Hannah. He came to England to see her in 1723. Hannah was very happy to see him. He told her all of the news from the colony. They discussed how to handle the problems. The current governor was Governor Keith. He was a good governor, but he didn’t like James Logan. The two men argued a lot. Hannah wrote a letter to Governor Keith. She told him to do things her way. She also made James Logan the new Secretary of the Government. While Logan was there, she set up a new accounting system. It kept track of who had paid their rents. She also gave Logan 5000 acres of land. By 1725 Hannah was feeling much stronger. Governor Keith still was not getting on with James Logan. She named a new governor and sent him to Pennsylvania. He arrived in June 1725. Hannah made a new will in January 1726. She left half of her land to John. One quarter each went to Thomas and Richard. Hannah sent one more petition to the court. She asked them to rule on William’s will. In December they finally decided. They ruled in favor of Hannah. She was William’s heir. It had taken 8 years. Hannah had little money and no strength left. Hannah had a second stroke one week later. She was well all day. She ate dinner. Then, suddenly, she could not speak. She died 20 hours later. Hannah had done a good job. People in Pennsylvania were free to worship. They lived in peace. Hannah's children owned the land in Pennsylvania until the Revolutionary War. After that, it did not have any one owner. It became part of a state in the new United States. Long after her death, Hannah was honored in a special way. On November 28, 1984 President Ronald Reagan made both Hannah and William Penn honorary citizens of the United States. 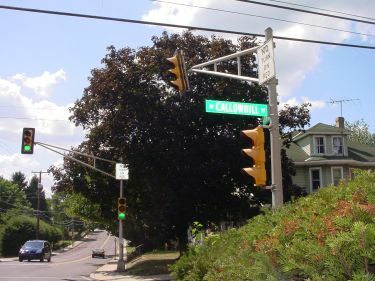 There are several streets in the Philadelphia area named Callowhill. This is Hannah’s family name. There is a Hannah Penn Middle School in York, Pennsylvania. Reading Level 3.9. Sketch of Hannah Penn courtesy of the Friends Historical Library at Swarthmore College. Callowhill Street sign M. Yates.